The author of this small box is A. Pakhomov. 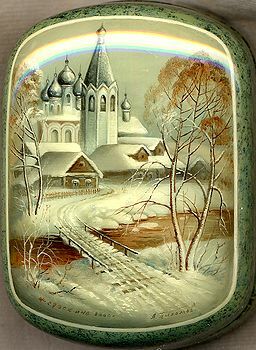 Here he depicts a peaceful winter landscape and the Church and a view remind us another center of Russian Lacquer miniature-Kholui. An enigmatic beauty of a small Russian village in winter is successfully expressed here. Enchanting! The scene is framed with a white line; white and gold lines wrap around the box's sides. The box's exterior imitates the coloring of blue marble (dark green and blue tiny veins are scattered against the light blue background). The interior is traditionally red. The edges of the lid's interior and the edges of the interior of the box's body are outlined with gold. The box is constructed from paper-mache. The lid is hinged from the left of the scene, and the box rests on a flat bottom. The work is signed with the artist's name, the village of Fedoskino, and the year of 2006.